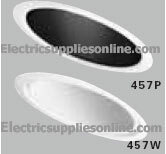 These 6" slope ceiling incandescent trims are for use with Halo's 6" slope ceiling incandescent housings. Halo lighting products are designed and engineered with the quality difference you've come to expect from the industry leader. You can be assured of quality material, sound construction and unmatched service in every recessed, track and surface luminaire.